Home > Ask Our Experts > Can a Neighbour Shoot Birds That Fall Into My Garden? Our neighbour has been using his shotgun to shoot birds sitting in our trees. We both have 2 acre gardens in a village. He has remained on his land, but the pigeons and magpies fall dead in my garden. My children and I find it quite unpleasant to find these dead animals. Is he allowed to do this? It is a criminal offence to trespass onto land belonging to other people for shooting purposes unless you have gained permission from the land owner beforehand. In this scenario, your neighbour has not actually trespassed onto your land, and does not technically need to ask your permission to shoot as a result. However, shooters need to be aware of the fact that their bullets may come off objects and land on your property. If your neighbour is shooting at birds that are sitting in your trees, there is a definite possibility that his bullets will fall onto your land (as well as the dead birds). This is considered to be illegal if you do not give prior permission for shooting to take place on your land, as a bullet entering your private land is deemed to be much the same as trespassing. Based on this, you would have grounds to lodge a formal complaint, particularly as the dead birds are located on your land. Although birds such as pigeons and magpies are often considered to be fair game due to their reputation as pests, it is not necessarily acceptable to shoot them unless you have authorisation to do so. The Department for Environment, Food and Rural Affairs (DEFRA) allows certain “pest” birds to be shot under their Open General Licence, but you still need to have authorisation for this. If your neighbour does not have this authorisation, he is technically not allowed to shoot the birds, even if he is not setting foot outside of his own land while shooting. In the UK, the 'pest' birds covered by the DEFRA Open General Licence include feral pigeons, Canada geese (not in Scotland, Wales or Northern Ireland), carrion crows, herring gulls, house sparrows (not in England), jackdaws, magpies, rooks, starlings (not in England) and woodpigeons. To shoot them, you must be sure that they are definitely pests, and that there is no better way to stop them from remaining as pests in the future (for example, scaring them away or proofing). Possible reasons can include spreading disease and destroying your crops. So, does that mean I can prosecute a shoot manager who allows shot to land in my property? It depends on what else is around you and who owns the field. 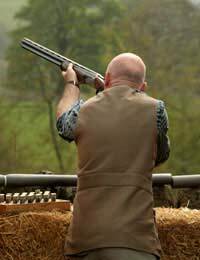 You will need authorisation before shooting - contact your local shooting club for information about what you can and can't do. You can also check out this information: Shooting rules and regs. It is a shotgun and I do have a licence.